A recent children’s picture book release, by author and former El Dorado Hills resident Rae Rankin, celebrates the bond between children and horses. Cowgirl Lessons, a children’s picture book, celebrating the bond between children and horses was released in October. The story, inspired by a real girl, horse, and El Dorado County Horsewoman, Valerie Baker of White Horse Dressage, follows a girl as she prepares for her weekly horse riding lesson, from searching her room for a lost boot, to arriving at the barn to see the horse she loves, to receiving great advice from her instructor, to ending the day ready to ride again. Mrs. Rankin’s daughter began taking lessons from Ms. Baker in 2011 when she was 6 years old on one of Ms. Baker’s school horses Duchess. “Duchess was the best horse for little girls,” Ms. Rankin said. “My daughter loved her very much, she was very gentle.” After the Rankins moved first to Utah and then to Washington state, Rankin said, “Ms. Baker has continued to be a positive role model for my daughter (now 12) who still rides at a barn outside of Seattle. When Mrs. Rankin learned from Ms. Baker that Duchess had passed away, she knew she had to do something to honor both Ms. Baker and the memory of Duchess. Rankin also hopes families will recognize the love between parents and children in the book. Rae has always had a passion for writing and reading. Cowgirl Lessons is her first children’s book. Her second book is in the illustration process. 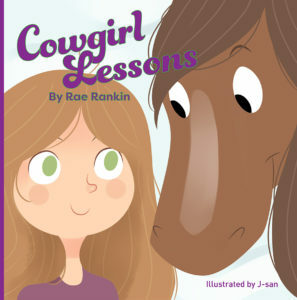 Cowgirl Lessons is available online at www.Amazon.com, www.barnesandnoble.com, www.powells.com, and other major retail outlets.